One beauty product which is absolutely essential in my makeup arsenal is pressed powder. Having combination skin, I need to set my foundation to make it last throughout the day, and also to prevent my T-zone from looking shiny. I especially like using translucent powder, as I find it keeps my makeup from looking cakey. Insert the new Make Up For Ever HD Pressed Powder*, which has quickly become my go-to powder for finishing off my face makeup! One of Make Up For Ever's best-sellers is their HD Microfinish Loose Powder, and this new release is basically the same product in a pressed version, making it much more user-friendly as it comes in a mirrored compact. One major benefit of this product is that it is talc-free and contains a blend of three innovative ingredients, namely synthetic mica, silicone powders, and silica, meant to diminish the appearance of fine lines and pores. Not only that, but it also contains hyaluronic acid, one of my favourite skin care ingredients, since it keeps the face hydrated and thus prevents the formation of dry patches. The very first time I used this powder paired with my big fluffy face brush, I immediately noticed it smooth out my pores - no kidding, it was like magic right before my eyes! The lightweight finish was also very refreshing since all of the powders I have tried so far have always felt somewhat heavy on my skin. The HD Pressed Powder is white both in the pan and swatched on the finger, but it blends seamlessly into the skin once applied with a brush. I just love the idea of a universal face powder shade (in case you were wondering, it is in fact designed to work on all skin tones)! Another area where it doesn't disappoint is its lasting power - it really keeps the oils at bay, and I do not need to blot my face throughout the day, which I usually have to do with my other face powders. Furthermore, being finely milled and having a mattifying effect, this powder makes my face look extra flawless not only in person but also on screen thanks to its HD camera-tested formulation. 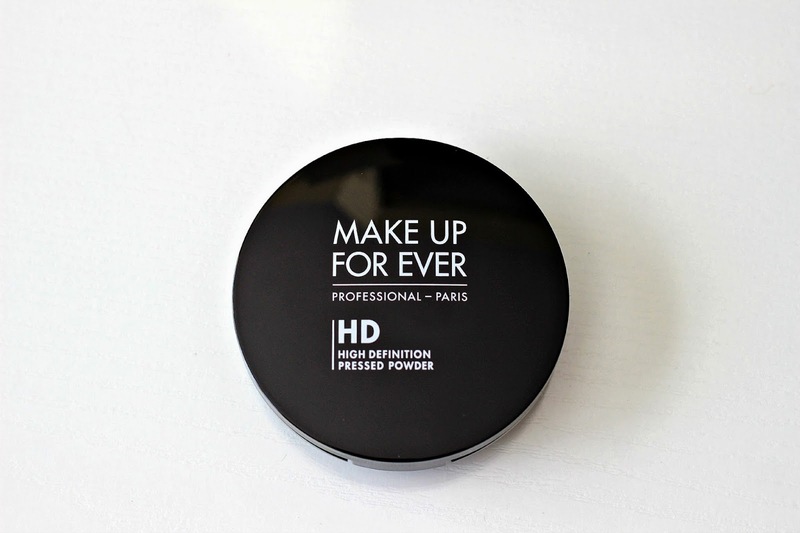 If you are looking for a powder that will transform your beauty routine, the Make Up For Ever HD Pressed Powder is exactly what you need! This powder is sold exclusively at Sephora, both in stores and online, as well as at Make Up For Ever boutiques, and retails for C$41.00 for 0.21oz, or 6.5g of product. How to do you prefer your face powder? Loose or pressed, and translucent or colored? *Disclaimer: This product was kindly sent to me and has been reviewed in accordance with my Disclosure Policy. I'm been trying these out these few days, I like it so far! Sounds amazing, like a magic skin transforming powder! My only thing is that when I touch up for oils I'd also like to add on coverage with a powder! I love this powder, I have this one and the loose one. This size is great to keep in your purse for touch-ups. I am using pressed translucent powder, sadly, other brand ;) Nice review. I really want to try this one but I am scared of how it will look on camera. I've heard it makes the skin a bit chalky under certain lighting. Have you tested it out with flash yet? I haven't, only in natural lighting. I'll have to test it out! I have been wondering about this, thanks for the review! Sounds great! I do prefer a pressed powder just because its easier. Although my two favorite powders are the NARS light reflecting pressed and the Coty airspun loose. I always wondered about this pressed powder. I too have combination skin, so I might need to give this a try. Stopping by from the weekday linkup.